While Oswego Lake in Lake Oswego, Oregon, is a private lake, you don’t have to live on it to enjoy it. Twenty easements located around the lake give 3,000 non-waterfront homeowners the opportunity to live the lake lifestyle without paying waterfront prices. Buying a home that had easement rights was an important criterion for Bonnie and Jim Trumbull when they bought their house nine years ago. They joined the South Shore Glen easement right away which gave them access to the docks for swimming. One year later, a boat slip opened up and they have been offering the “Trumble Tour” to family and friends ever since. When Katharyn and Mike Thompson first moved to Lake Oswego from Colorado, they didn’t know much about the lake but lucked out buying a house with deeded lake access to the Palisades easement. The next time they moved, they made sure their house came with easement rights. Now she is president of the Blue Heron easement. Her family uses it about four times a week during the summer for boating, kayaking, water sports, evening cruises and commuting to the Farmer’s Market and downtown restaurants. With four kids, Suzy and John Lautze are at their Lakeview Recreation easement more summer days than not, for boating, swimming, and paddle boarding. Recently the easement added a larger dock that has provided a popular gathering place for neighboring families on sunny afternoons. “It’s like having a vacation spot in your backyard,” Suzy explains. All this fun does come with a price. There are annual dues, an annual meeting and usually a maintenance workday. Some easements also hold socials. Each easement only has a limited number of boat slips for which there can be a waiting list. 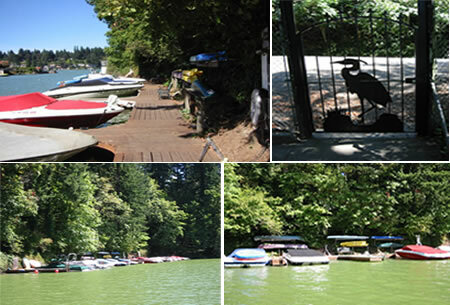 Once a boat slip is secured there is an annual easement fee as well as Lake Oswego Corporation fees. But to easement members, it’s well worth it. For a complete listing of Lake Oswego easements, visit the Lake Oswego Corporation website. If you’re interested in finding a home to buy in Lake Oswego with easement rights, give me a call at 503.939.9801. I’d love to show you around. Photo provided by Lake Oswego Corporation. This entry was posted in Lake Oswego homes and tagged Lake Oswego Corporation, Lake Oswego Oregon, Lake Oswego waterfront homes, Oregon, Oswego Lake easements. Bookmark the permalink.